Most Christians are anxious to go to Heaven after their death. Usually, Christians meditate and talk about Heaven many times before their death. The Thoughts of Heaven bring them relief from a world that at times can seem sad and incredibly awful to experience. Mary C. Neal. 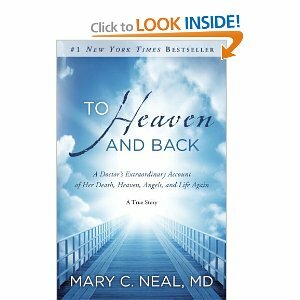 MD, the author of TO HEAVEN AND BACK had an extraordinary experience. After a horrible kayaking accident in South America, she loses her life. To me, the capsized kayak seemed to be smothering her to death by turning upside on her body in roaring, swift waters. Mary's friends did all they could to save her. Alas, she died. Thankfully, she goes to Heaven where she feels nothing but peace and love. "The river, when it was in a good mood, had this way of making you feel contented within the moment, making you feel that all was right with the world."